Slat Grid Panels are very handy when creating wall displays! Measuring 2' x 6', this panel is great for almost any size items or accessories. This piece is featured in a sleek Chrome finish that looks clean and professional, but is also available in black or white if you choose. 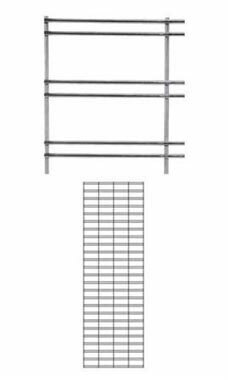 Hard to make displays are now a thing of the past with these Slat Grid Panels! These panels can accept gridwall or slatwall fixtures, which are all sold separately. The panels are made of sturdy wires that are spaced in sets of 2 with a large space in between each set, which gives the unit a sleek and stylish look. Orders must be placed in increments of 2 panels. In stock and available for immediate shipment. Heavy duty! Handles daily setup, transportation and looks great for self standing configurations for product displays and as an added benefit offers security for overnight shows!